On August 22nd, a snorting gorgeous bundle of pug entered my life. After losing my French Bulldog Jackson in June, my 10 year old pug Cooper and I were lost. When Marcia called me and told me a little fawn female had been found living at a construction site in Opa Locka and would I be interested in fostering her, I agreed thinking it would be good for Cooper. Well thank heaven I said yes. From the moment I laid eyes on this little angel, she has changed my life. I work in a very stressful job and coming home each night and seeing her little goofy underbite smiling up at me takes me to a better place. She has lifted my spirit and Cooper’s too and has fit into our family like a missing puzzle piece. I cannot imagine my life without her. 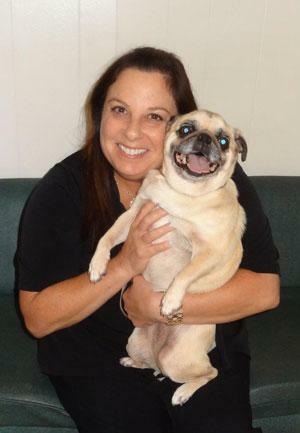 Thank you Compassionate Pug Rescue for bringing us Opa – the greatest gift in the world.